Evgeny Feldman is a young Russian photojournalist and contributor to the “New Newspaper,” one of only a few independent newspapers in today’s Russia. 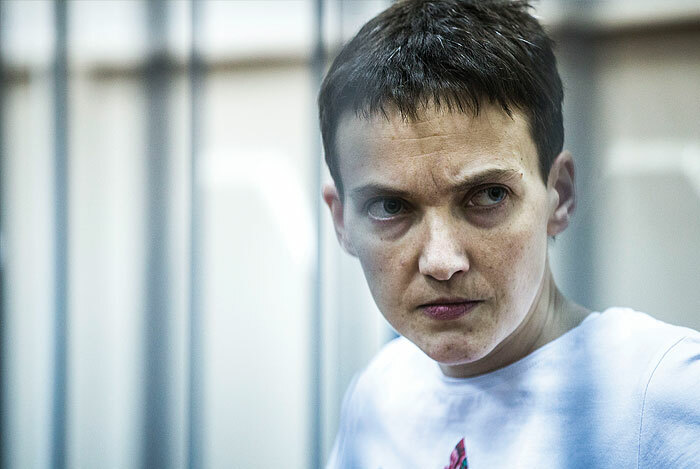 His work includes the moving photos of Nadia Savhcenko behind bars in a Moscow court, which appears on Mashable and in the Associated Press wire, enabling the West to become more aware of the situation in Ukraine. From the beginning of the Maidan, he has visited Ukraine at least 25 times and spent seven months there, photographing Kyiv, Crimea, and Donbas. 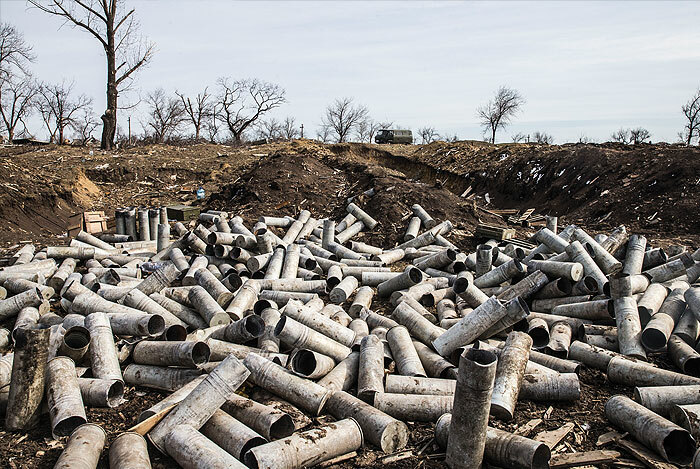 Soon, his photographs will be on display in Chicago, at the Ukrainian National Museum’s exhibit “Zone of Conflict: Ukraine,” which debuts in May,8 and depicts the works of photographers from the ATO zone in Donbas. 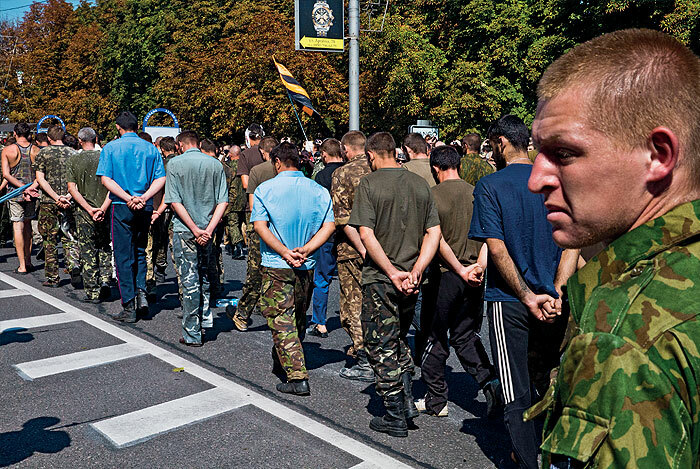 Ukrainian Chicago Magazine spoke with Evgeny Feldman about what it is like to work on both sides of a war zone, and whether he pictures a future of peace between Russia and Ukraine. 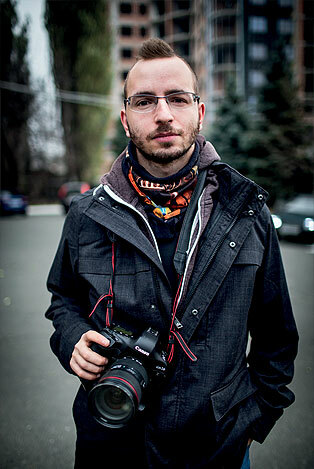 As a photojournalist, Evgeny challenges himself to be at and photograph every important event. He illustrated the Arctic Sunshine, presidential elections in Turkey, and the March of Unity in Paris just days after the terrorist attacks on Charlie Hebdo. Because of his professional discipline and curiosity, he ended up in Kyiv. Feldman considers himself an independent journalist, who doesn’t adhere to any political ideology. “Of course, I maintain beliefs internally, and feasibly could open up about them publicly. But it is not my responsibility to ‘stand with the flag,’ in the widest sense of the idiom. I have the opposite responsibility — to be everywhere and witness all events,” he said. This kind of objectivity allows him to photograph in the East, on both sides of the conflict. 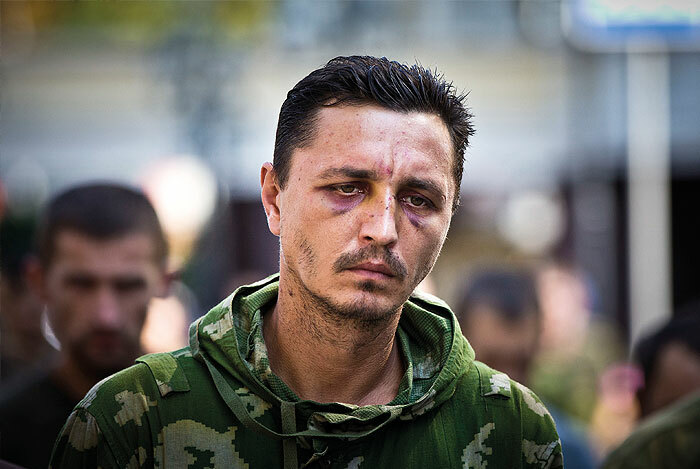 He photographed the separatists forcing Ukrainian POWs to rebuild the ruins of Ilovasnk. “Other than me, nobody will photograph any of that. If anything, Russian photographers will only go there out of contempt,” said Feldman. However, Feldman does believe that the war in Donbas is absolutely a product of propaganda. He witnessed a group of fighters in Donetsk who were fighting because they heard a fabricated story about a boy who had been crucified. “Unfortunately, these people are fighting because they are inspired by propaganda. As an eyewitness, I can say that stories like [the one about the crucified boy] are abundant. Without propaganda, there would be no war,” said Feldman. The most difficult events for Feldman to photograph were the firefights at the Donetsk airport. He said that this will be remembered as if it were his second birthday. Feldman photographed Mariupol in the time leading up to Ukraine’s parliamentary elections, and the actual voting in areas temporarily out of Ukraine’s control. “I captured how things looked at such a complicated time in an occupied territory. Miners worked as though imprisoned. I saw this just on the street in Donetsk,” said Feldman. He felt particularly honored when his photos were being shared by Ukrainian newswires, as well as by separatists in their groups and on social media. “This was a victory for me because anybody can photograph what they want, guided by their own biases. This means that one photo’s depiction of something can speak to both sides, and find a middle ground, despite both sides being so far apart in worldview. When you meet people in the middle like that, you can be honest with yourself and with your audience. 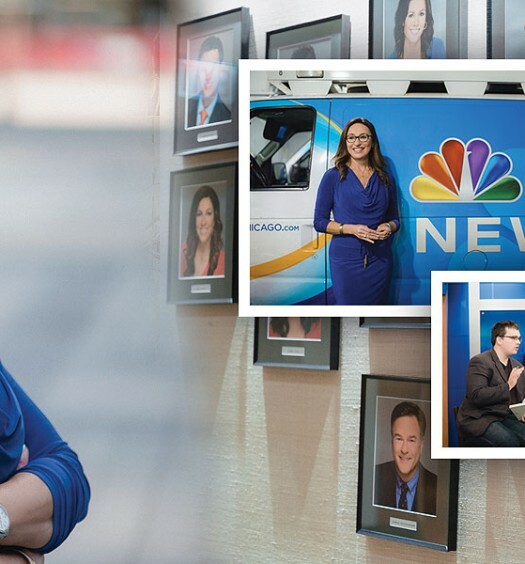 When you start taking up politics — in any fashion — you have to stand on your platform and sacrifice honesty,” said Feldman. “I was photographing from the side of the separatists, because there was no other way in. 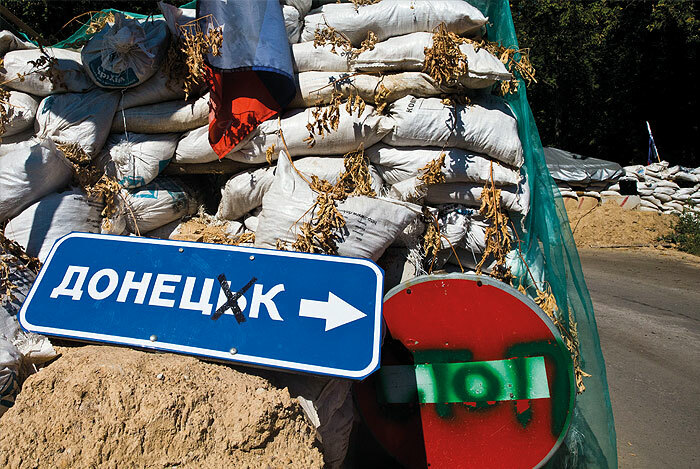 There was nothing else going in Donetsk at the time, in terms of battles; the city was living its normal life. When we got there by taxi, they had been shooting from everyplace at everything they could. There were a lot of journalists. We sat, laid in the bushes, and saw how the different sides were running at each other. There were these whooping sounds around us. At the time, there were no thoughts about which side we were on,” said Feldman. After several months of shooting in Ukraine, Evgeny had gathered a lot of material, and decided to publish a book. He called it “Vroz’,” which means “Apart” in English. The book was published through a crowdfunding effort on the Russian site Planeta.ru. Much to the surprise of the photographer, most of the interested sponsors were in Russia, not Ukraine, and raised more money than it cost to publish the book. The book’s first run in Russia included 1,500 copies, 850 of which were advance orders. “No store, publisher, or other middleman was involved in the publication of this book,” said Feldman.He is looking to build on his personal success with the book in Russia with a fully Ukrainian-language run of the book. 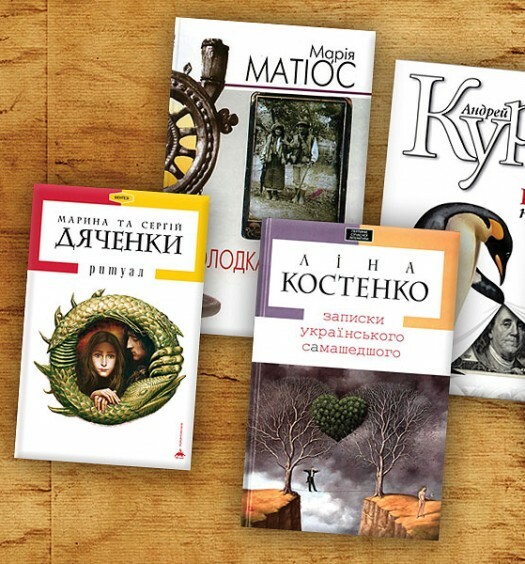 The photographer intends to donate all profits of the Ukrainian-language book to the U.N. Commission for Refugees. “’Vroz’’ is in and of itself a resistance to NGOs and governments,” said Feldman. He blames misunderstanding for all that happened in Kyiv in February. “It was the deafness of the government to its people,” he said. “I saw how people on the Maidan radicalized because their government projected an image that there was no nation worth working for.”The word “Vroz’” can also be taken as a message that there are people on both sides of the border who do not want to fight with separatists over trivial issues. There are millions of people in Russia and Ukraine who have family in both of those countries. I am a Jew, and my father is from Zhytomyr. I don’t want to consider Ukraine a foreign country. But will Ukraine and Russia ever have a future? 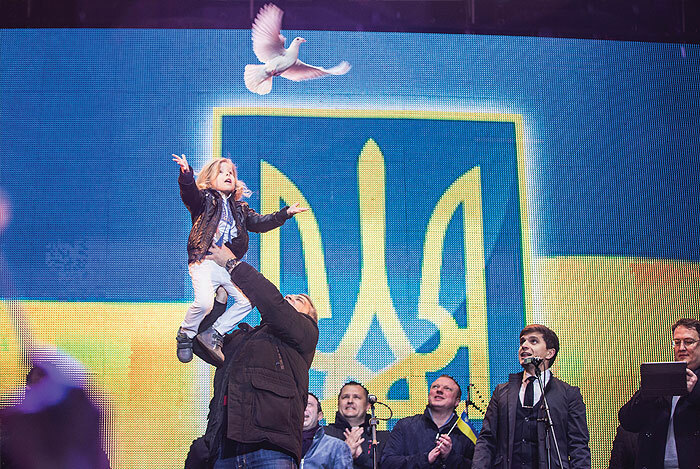 Feldman thinks the future is foggy, but his contact with friends in Ukraine gives him hope. “When I visit Kyiv and I see my friends, I don’t care about the bad blood flowing among us. I can talk about frustration, the situation in Donbas. Sometimes people tell me that because I’m Russian, I should be photographing Khakassia instead of Ukraine. I understand that my Ukrainian friends are closer to me, than those at home who write to me as if I sold my soul to the [U.S.] Department of State,” said Feldman.